Hotel Sacher Salzburg prides itself on impeccable service. The Arthotel Blaue Gans is the oldest inn in the city of Salzburg, dating back 660 years. The arthotel Blaue Gans is the oldest inn in the city of Salzburg. It boasts a prime location in the heart of the historic centre, which has been declared a UNESCO World Cultural Heritage Site, and is only a short walk from Mozart’s birthplace. Today the historic walls of the inn pop with modern design and contemporary art, making it both a timeless classic and a haven for the well-travelled and well-read. Another room in the Hotel Sacher Salzburg. Opened in 1866, this historic hotel offers magnificent views of Salzburg. The family-owned, five-star hotel combines elegant luxury and tradition and prides itself on impeccable service. After a major refurbishment, all 113 rooms and suites are now decorated with original paintings, antiques, precious rugs and silk wallpaper to enhance the historically-rich setting. At the legendary Café Sacher Salzburg, the world famous Original Sacher-Torte is served with traditional coffee specialities, while The Sacher Bar comes with a riverside terrace popular with locals and visitors alike. Hotel Schloss Mönchstein is set on Mönchsberg Mountain in a three-and-a-half-acre castle park. Located in the heart of Mozart’s home city of Salzburg, this five-star hotel boasts unparalleled views over the city, idyllically set on Mönchsberg Mountain in a three-and-a-half-acre castle park. 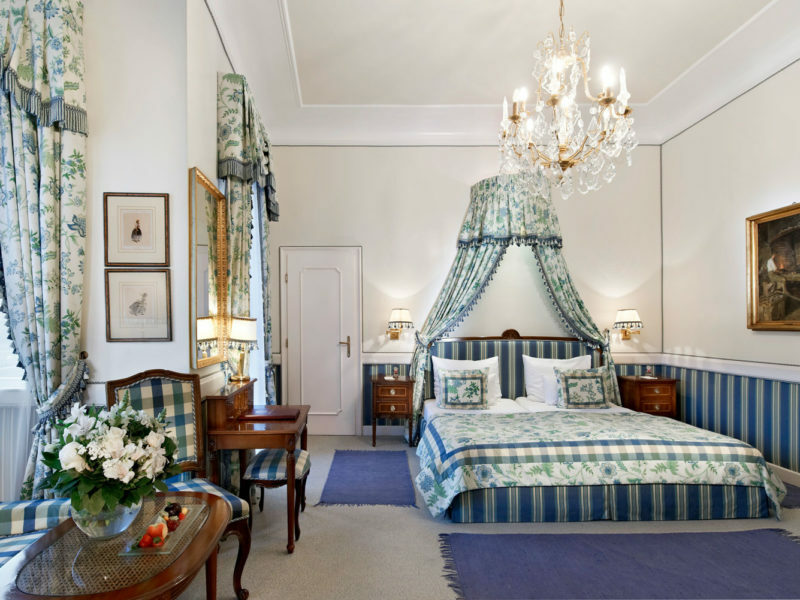 Meanwhile inside are just 24 exclusive rooms and suites, each individually designed as either a ‘Viennese studio’ or in a more traditional style with precious antiques. While there, make time to savour the award-winning cuisine at the hotel’s restaurant, or relax in the outdoor infinity pool and whirlpool. The Hirnböck-Gmachl family has run this boutique spa and wellness hotel for 23 generations. Take full advantage of the spa at Romantik Hotel Gmachl. Located in a small town three miles outside the city of Salzburg, the hotel is famous for its romantic setting with beautiful gardens set amongst the luxury accommodation. It is the perfect hideaway for discerning travelers. Hotel Goldener Hirsch is situated in Slazburg’s Old Town and is a 5 minute walk from Mozart’s birthplace. Hotel Goldener Hirsch has retained all its romantic charm as a former 15th century guest house and added the sophistication and ambience of a modern five-star hotel. The vaulted ceilings, taxidermy and staff’s traditional Austrian dress create an atmosphere of both comfort and distinction. 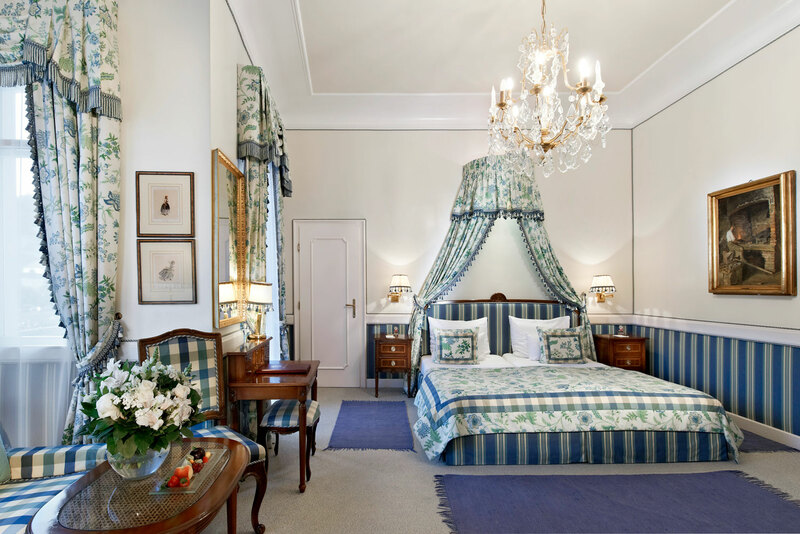 A collection of antiques and handmade furniture reflects the hotel’s 600-plus years in Salzburg. Being in the center of the medieval old town makes it a great location for strolling the historic centre of Slazburg. For more information on what to do and where to stay in Austria, read our guide here.